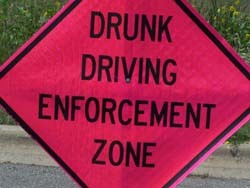 Wisconsin law enforcement agencies are stepping up efforts to keep drunk drivers off the roads. Police agencies across the state are again joining a national effort that tells drivers if they&apos;re over the limit, they&apos;ll be under arrest. State Transportation Safety Director Major Dan Lonsdorf says the two week campaign focuses on the time around Labor Day, when the highest number of alcohol related crashes in the state occur each year. Lonsdorf says over 300 law enforcement agencies and local groups in Wisconsin will be taking part in the campaign. The effort involves a media campaign and increased patrols, designed to make drivers think twice about getting behind the wheel after drinking. Lonsdorf says many officers feel very strongly about keeping drunk and impaired drivers off the roads because they&apos;ve seen the impact a deadly crash can have. Alcohol-related crashes in Wisconsin killed 337 people in 2007 and injured 5,552 more.